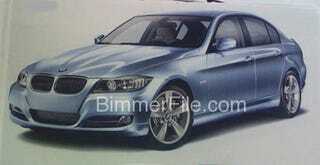 For those curious what the mild mid-cycle refresh of the 2009 BMW 3-Series is going to look like, the folks at Bimmer-File has gotten ahold of scans from a marketing brochure that appear to show the full monty. Compared to the current crop there are some obvious changes to the front of the car, including revised lamps, fog lights and mirrors. They've also taken a lot of care to squeeze a few more lines into the hood. Understandably, our biggest interest in the 2009 3-series is the possibility of all-but confirmed BMW 335d, which we hope will hit shores this fall. What do you all think? Going in the right direction or retreating from classic BMW style?